Is Silnylon Worth the Price? 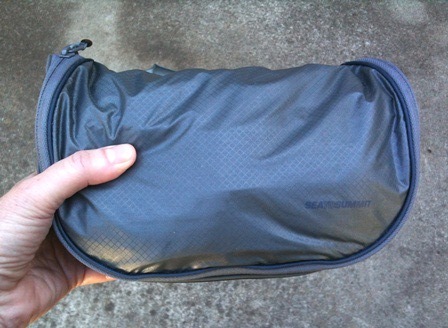 The Eagle Creek Specter Half Cube easily holds all of the items in my comfort pack with room to spare. Most of the weight comes from the zipper! 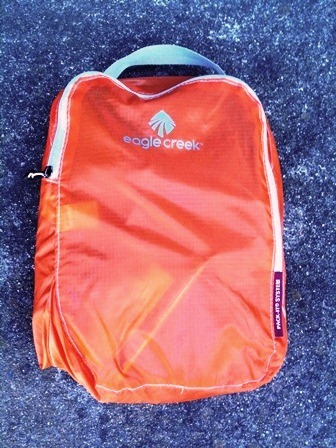 I recently upgraded my travel comfort pack from an Eagle Creek Pack-It Sack to an Eagle Creek Specter Half Cube. The main reason was weight savings – the newer silnylon bag was less than half the weight of the old poly bag. While this weight savings may not seem like a huge deal, it actually is. A few ounces here, a few there – they all add up to pounds (or kilograms) in the bag. That is important – first for your back, and second if your airline has a strict weight limit for carry-on bags. I would prefer taking my clothes instead of packaging if my bag is at limit. Unfortunately, light weight packaging comes at a cost. There is a universal rule that when you buy a lighter version of something – anything – it also lightens your wallet. In this case the cost of the silnylon bag is approximately 1-1/3 times the cost of the older poly bag. The cost is significantly more than a simple plastic zip-top bag. So is a silnylon bag worth it? The answer is… it depends. 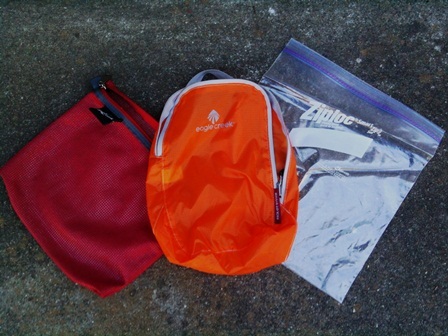 Left to right – Eagle Creek Medium Pack-It Sack, Eagle Creek Specter Half Cube, and a one gallon Zip-Lock baggie. I have to admit that my bag of preference is actually the plastic zip-top. It is inexpensive, comes in a variety of sizes, and is relatively waterproof. The zip-top is the lightest option going. Unfortunately, it is easily punctured. That makes it ill-suited for applications where abrasion is normal – such as my travel comfort pack. It also performs poorly when the bag is in constant use, such as a toilet kit. Some people just accept this as part of the weight savings game and frequently replace their zip-top bags. I think it is a hassle to constantly repack my toilet kit and comfort pack. That is why I looked at silnylon as an alternative. This hanging "ultra-sil" toiletry kit from Sea-to-Summit is a very light weight 2.8 oz (80g). It is semi-permeable, which means that wet soaps and other items have a chance to dry out. Silnylon is short for Silicone Impregnated Nylon. The impregnation makes the nylon strong for its weight, and improves its tear strength. This allows the manufacturer to use a lighter version of nylon and have a fabric as strong as the older, heavier polyurethane coated fabric. The finished silnylon product is significantly lighter than the poly version of the same product. Silnylon does have some strange characteristics. It feels stiffer than other types of nylon. It is not waterproof, but is water resistant. I actually consider this to be an advantage. if something is wet inside my silnylon bag, it will eventually dry out. I especially like this for my toilet kit which holds wet soaps, toothbrushes, and face scrubs. For the most part it performs the same as a heavier nylon bag. I have listed the differences in the table below. The outdoors/ultra-light backpacking community was the first to use silnylon. It was later adopted by adventure travel vendors such as Eagle Creek and Sea-to-Summit. The prices for silnylon products have dropped as the market has expanded, but are still high. Is the silnylon worth it? In the end it comes down to personal choice. I’m happy that I upgraded my toilet kit and comfort pack to this new material. The comparisons you highlight are very helpful. Thank you. My first choice is the zip top bag, but I’ll look at the “new” bag you’ve posted on as well. They are available from a wide variety of vendors – REI, EMS, Campmor, and Packinglight all carry them. Eagle Creek uses the brand name “Specter” while Sea-to-Summit uses the name “Ultra-Sil”. We bought one of these bags, the medium size to put our laundry kit in. Everything fits, laundry soap, clothe line, inflatable hangers, hooks, suction cups, the whole works. When we toss it in my bag is finds its place. Its worth the price. We also bought the small size for the charger, cord, and adapter. Thanks for your inputs Monte. It is always good to hear the opinions of other go-light one-baggers such as you and Sharon. I don’t use packing cubes (luggage for my luggage, someone called it), but I do have a ridiculously lightweight Sea to Summit backpack that goes on most every trip and gets a lot of use in my daily life as well. Very early on it got a puncture from , and I was afraid that was it, but the small tear has not gotten any larger and there are no new ones. It’s been worth the money. Yes, I actually have a S2S bag myself. They are extremely lightweight and compact. My biggest complaint is the shoulder straps. They cut into my shoulders when I’m carrying heavier loads like groceries. I went back to my WaderlIte pack. But if you are only carrying light loads the S2S is ideal. I like your blog. My Mom was in a wheelchair at the end of her life. I can really relate to some of your stories! Yes, because I’m a wheelchair user, my backpack doesn’t go on my shoulders, so the comfort issue doesn’t arise for me – in fact, I’m always hunting for minimal shoulder straps.